A new climate model combines data on ice loss from both polar regions for the first time. Last week, rivers froze over in Chicago when it got colder than at the North Pole. At the same time, temperatures hit 47℃ in Adelaide during the peak of a heatwave. Such extreme and unpredictable weather is likely to get worse as ice sheets at both poles continue to melt. Our research, published today, shows that the combined melting of the Greenland and Antarctic ice sheets is likely to affect the entire global climate system, triggering more variable weather and further melting. Our model predictions suggest that we will see more of the recent extreme weather, both hot and cold, with disruptive effects for agriculture, infrastructure, and human life itself. We argue that global policy needs urgent review to prevent dangerous consequences. Even though the goal of the Paris Agreement is to keep warming below 2℃ (compared to pre-industrial levels), current government pledges commit us to surface warming of 3-4℃ by 2100. This would cause more melting in the polar regions. Already, the loss of ice from ice sheets in Antarctica and Greenland, as well as mountain glaciers, is accelerating as a consequence of continued warming of the air and the ocean. 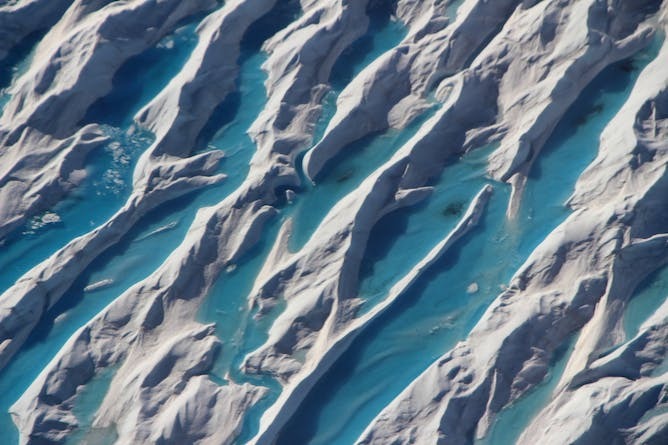 With the predicted level of warming, a significant amount of meltwater from polar ice would enter the earth’s oceans. The West Antarctic Ice Sheet is considered more vulnerable to melting, but East Antarctica , once thought to be inert, is now showing increasing signs of change. We have used satellite measurements of recent changes in ice mass and have combined data from both polar regions for the first time. We found that, within a few decades, increased Antarctic melting would form a lens of freshwater on the ocean surface, allowing rising warmer water to spread out and potentially trigger further melting from below. In the North Atlantic, the influx of meltwater would lead to a significant weakening of deep ocean circulation and affect coastal currents such as the Gulf Stream, which carries warm water from the tropics into the North Atlantic. This would lead to warmer air temperatures in Central America, Eastern Canada and the high Arctic, but colder conditions over northwestern Europe on the other side of the Atlantic. Recent research suggests that tipping points in parts of the West Antarctic Ice Sheet may have already been passed. This is because most of the ice sheet that covers West Antarctica rests on bedrock far below sea level – in some areas up to 2 kilometres below. It can be a challenge to simulate the whole climate system because computer models of climate are usually global, but models of ice sheets are typically restricted to just Antarctica or just Greenland. For this reason, the most recent Intergovernmental Panel of Climate Change (IPCC) assessment used climate models that excluded ice sheet interactions. Global government policy has been guided by this assessment since 2013, but our new results show that the inclusion of ice sheet meltwater can significantly affect climate projections. This means we need to update the guidance we provide to policy makers. And because Greenland and Antarctica affect different aspects of the climate system, we need new modelling approaches that look at both ice sheets together. When the edges of the West Antarctic Ice Sheet start to recede, they retreat into deeper and deeper water and the ice begins to float more easily. Apart from the impact of meltwater on ocean circulation, we have also calculated how ongoing melting of both polar ice caps will contribute to sea level. Melting ice sheets are already raising sea level, and the process has been accelerating in recent years. Our research is in agreement with another study published today, in terms of the amount that Antarctica might contribute to sea level over the present century. This is good news for two reasons. First, our predictions are lower than one US modelling group predicted in 2016. Instead of nearly a metre of sea level rise from Antarctica by 2100, we predict only 14-15cm. Second, the agreement between the two studies and also with previous projections from the IPCC and other modelling groups suggests there is a growing consensus, which provides greater certainty for planners. But the regional pattern of sea level rise is uneven, and islands in the southwest Pacific will most likely experience nearly 1.5 times the amount of sea level rise that will affect New Zealand. While some countries, including New Zealand, are making progress on developing laws and policies for a transition towards a low-carbon future, globally policy is lagging far behind the science. The predictions we make in our studies underline the increasingly urgent need to reduce greenhouse gas emissions. It might be hard to see how our own individual actions can save polar ice caps from significant melting. But by making individual choices that are environmentally sustainable, we can persuade politicians and companies of the desire for urgent action to protect the world for future generations. 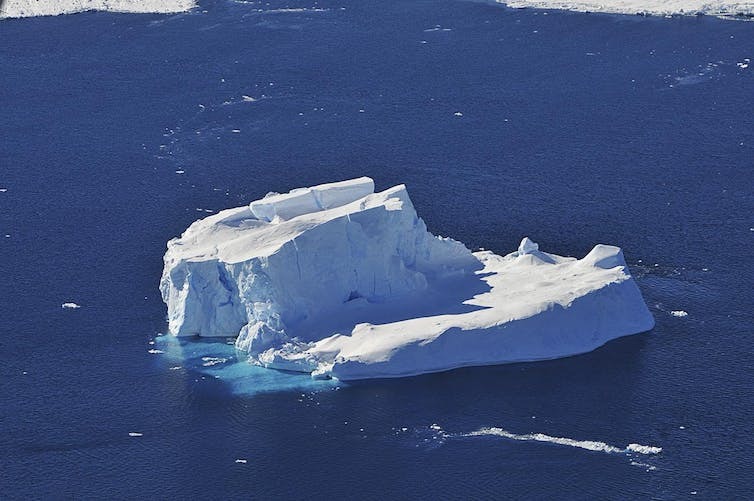 Melting Antarctic ice can trigger effects on the other side of the globe. Melting of Antarctica’s ice can trigger rapid warming on the other side of the planet, according to our new research which details how just such an abrupt climate event happened 30,000 years ago, in which the North Atlantic region warmed dramatically. This idea of “tipping points” in Earth’s system has had something of a bad rap ever since the 2004 blockbuster The Day After Tomorrow purportedly showed how melting polar ice can trigger all manner of global changes. But while the movie certainly exaggerated the speed and severity of abrupt climate change, we do know that many natural systems are vulnerable to being pushed into different modes of operation. The melting of Greenland’s ice sheet, the retreat of Arctic summer sea ice, and the collapse of the global ocean circulation are all examples of potential vulnerability in a future, warmer world. Read more: Chasing ice: how ice cores shape our understanding of ancient climate. Of course it is notoriously hard to predict when and where elements of Earth’s system will abruptly tip into a different state. A key limitation is that historical climate records are often too short to test the skill of our computer models used to predict future environmental change, hampering our ability to plan for potential abrupt changes. Fortunately, however, nature preserves a wealth of evidence in the landscape that allows us to understand how longer time-scale shifts can happen. One of the most important sources of information on past climate tipping points are the kilometre-long cores of ice drilled from the Greenland and Antarctic ice sheets, which preserve exquisitely detailed information stretching back up to 800,000 years. The Greenland ice cores record massive, millennial-scale swings in temperature that have occurred across the North Atlantic region over the past 90,000 years. The scale of these swings is staggering: in some cases temperatures rose by 16℃ in just a few decades or even years. Twenty-five of these major so-called Dansgaard–Oeschger (D-O) warming events have been identified. These abrupt swings in temperature happened too quickly to have been caused by Earth’s slowly changing orbit around the Sun. Fascinatingly, when ice cores from Antarctica are compared with those from Greenland, we see a “seesaw” relationship: when it warms in the north, the south cools, and vice versa. Attempts to explain the cause of this bipolar seesaw have traditionally focused on the North Atlantic region, and include melting ice sheets, changes in ocean circulation or wind patterns. But as our new research shows, these might not be the only cause of D-O events. Our new paper, published today in Nature Communications, suggests that another mechanism, with its origins in Antarctica, has also contributed to these rapid seesaws in global temperature. The 30,000-year-old key to climate secrets. We know that there have been major collapses of the Antarctic ice sheet in the past, raising the possibility that these may have tipped one or more parts of the Earth system into a different state. To investigate this idea, we analysed an ancient New Zealand kauri tree that was extracted from a peat swamp near Dargaville, Northland, and which lived between 29,000 and 31,000 years ago. Through accurate dating, we know that this tree lived through a short D-O event, during which (as explained above) temperatures in the Northern Hemisphere would have risen. 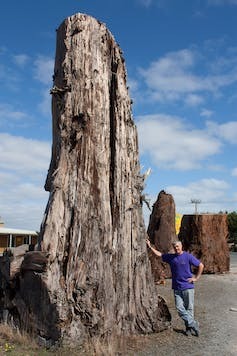 Importantly, the unique pattern of atmospheric radioactive carbon (or carbon-14) found in the tree rings allowed us to identify similar changes preserved in climate records from ocean and ice cores (the latter using beryllium-10, an isotope formed by similar processes to carbon-14). This tree thus allows us to compare directly what the climate was doing during a D-O event beyond the polar regions, providing a global picture. The extraordinary thing we discovered is that the warm D-O event coincided with a 400-year period of surface cooling in the south and a major retreat of Antarctic ice. When we searched through other climate records for more information about what was happening at the time, we found no evidence of a change in ocean circulation. Instead we found a collapse in the rain-bearing Pacific trade winds over tropical northeast Australia that was coincident with the 400-year southern cooling. Read more: Two centuries of continuous volcanic eruption may have triggered the end of the ice age. To explore how melting Antarctic ice might cause such dramatic change in the global climate, we used a climate model to simulate the release of large volumes of freshwater into the Southern Ocean. The model simulations all showed the same response, in agreement with our climate reconstructions: regardless of the amount of freshwater released into the Southern Ocean, the surface waters of the tropical Pacific nevertheless warmed, causing changes to wind patterns that in turn triggered the North Atlantic to warm too. Future work is now focusing on what caused the Antarctic ice sheets to retreat so dramatically. Regardless of how it happened, it looks like melting ice in the south can drive abrupt global change, something of which we should be aware in a future warmer world. Water mass enters the ocean from glaciers such as this along the Greenland coast. Contributions to the rate of global sea-level rise increased by about half between 1993 and 2014, with much of the increase due to an increased contribution from Greenland’s ice, according to our new research. Our study, published in Nature Climate Change, shows that the sum of contributions increased from 2.2mm per year to 3.3mm per year. This is consistent with, although a little larger than, the observed increase in the rate of rise estimated from satellite observations. Globally, the rate of sea-level rise has been increasing since the 19th century. As a result, the rate during the 20th century was significantly greater than during previous millennia. The rate of rise over the past two decades has been larger still. The rate is projected to increase still further during the 21st century unless human greenhouse emissions can be significantly curbed. However, since 1993, when high-quality satellite data collection started, most previous studies have not reported an increase in the rate of rise, despite many results pointing towards growing contributions to sea level from the ice sheets of Greenland and Antarctica. Our research was partly aimed at explaining how these apparently contradictory results fit together. In 2015, we completed a careful comparison of satellite and coastal measurements of sea level. This revealed a small but significant bias in the first decade of the satellite record which, after its removal, resulted in a slightly lower estimate of sea-level rise at the start of the satellite record. Correcting for this bias partially resolved the apparent contradiction. In our new research, we compared the satellite data from 1993 to 2014 with what we know has been contributing to sea level over the same period. These contributions come from ocean expansion due to ocean warming, the net loss of land-based ice from glaciers and ice sheets, and changes in the amount of water stored on land. Previously, after around 2003, the agreement between the sum of the observed contributions and measured sea level was very good. Before that, however, the budget didn’t quite balance. Using the satellite data corrected for the small biases identified in our earlier study, we found agreement with the sum of contributions over the entire time from 1993 to 2014. Both show an increase in the rate of sea-level rise over this period. The total observed sea-level rise is the sum of contributions from thermal expansion of the oceans, fresh water input from glaciers and ice sheets, and changes in water storage on land. After accounting for year-to-year fluctuations caused by phenomena such as El Niño, our corrected satellite record indicates an increase in the rate of rise, from 2.4mm per year in 1993 to 2.9mm per year in 2014. If we used different estimates for vertical land motion to estimate the biases in the satellite record, the rates were about 0.4mm per year larger, changing from 2.8mm per year to 3.2mm per year over the same period. Is the whole the same as the sum of the parts? Our results show that the largest contribution to sea-level rise – about 1mm per year – comes from the ocean expanding as it warms. This rate of increase stayed fairly constant over the time period. The second-largest contribution was from mountain glaciers, and increased slightly from 0.6mm per year to 0.9mm per year from 1993 to 2014. Similarly, the contribution from the Antarctic ice sheet increased slightly, from 0.2mm per year to 0.3mm per year. 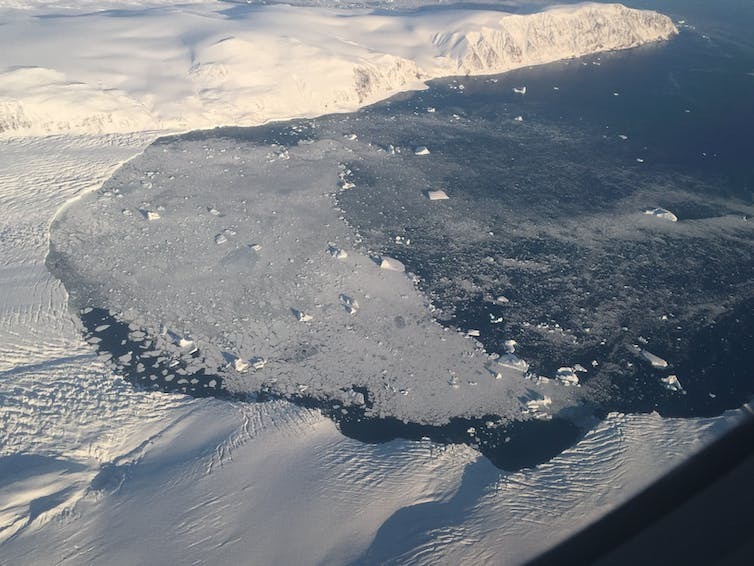 Strikingly, the largest increase came from the Greenland ice sheet, as a result of both increased surface melting and increased flow of ice into the ocean. Greenland’s contribution increased from about 0.1mm per year (about 5% of the total rise in 1993) to 0.85mm per year (about 25% in 2014). Greenland’s contribution to sea-level rise is increasing due to both increased surface melting and flow of ice into the ocean. The contribution from land water also increased, from 0.1mm per year to 0.25mm per year. The amount of water stored on land varies a lot from year to year, because of changes in rainfall and drought patterns, for instance. Despite this, rates of groundwater depletion grew whereas storage of water in reservoirs was relatively steady, with the net effect being an increase between 1993 and 2014. So in terms of the overall picture, while the rate of ocean thermal expansion has remained steady since 1993, the contributions from glaciers and ice sheets have increased markedly, from about half of the total rise in 1993 to about 70% of the rise in 2014. This is primarily due to Greenland’s increasing contribution. What is the future of sea level? The satellite record of sea level still spans only a few decades, and ongoing observations will be needed to understand the longer-term significance of our results. Our results also highlight the importance of the continued international effort to better understand and correct for the small biases we identified in the satellite data in our earlier study. Nevertheless, the satellite data are now consistent with the historical observations and also with projected increases in the rate of sea-level rise. Ocean heat content fell following the 1991 volcanic eruption of Mount Pinatubo. The subsequent recovery (over about two decades) probably resulted in a rate of ocean thermal expansion larger than from greenhouse gases alone. Thus the underlying acceleration of thermal expansion from human-induced warming may emerge over the next decade or so. And there are potentially even larger future contributions from the ice sheets of Greenland and Antarctica. The acceleration of sea level, now measured with greater accuracy, highlights the importance and urgency of cutting greenhouse gas emissions and formulating coastal adaptation plans. Given the increased contributions from ice sheets, and the implications for future sea-level rise, our coastal cities need to prepare for rising sea levels. 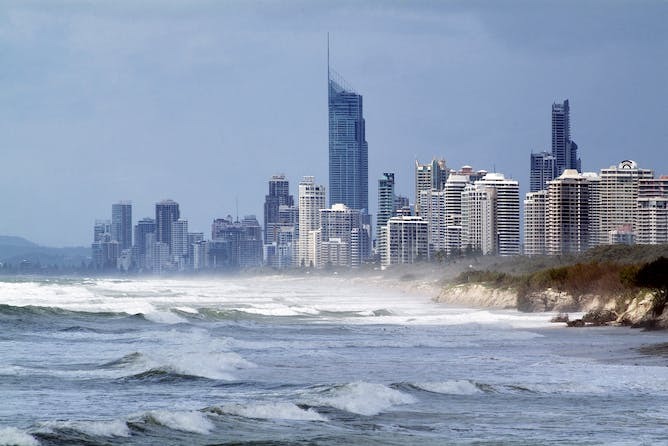 Sea-level rise will have significant impacts on coastal communities and environments. Last week, we got the news that the West Antarctic ice sheet is ditching us. Then, on Sunday, another fresh study told us that Greenland is also melting away rather fast. And now glaciology brings us a new report, on what’s going on at the so-called “third pole” (so called because it has more snow and ice than anywhere outside of the polar regions): the Himalaya mountain range. Seemingly unwilling to get left behind, it’s been shedding its icy stocks, too. The link below is to an article that looks at the rising threat of the Antarctic ice melt to sea levels around the world. The link below is to an article reporting on the massive ice melt at the North Pole.